I’m just getting started. I thought I had decided on the direction to go, but changed my mind twice already — there are so many variations out there! 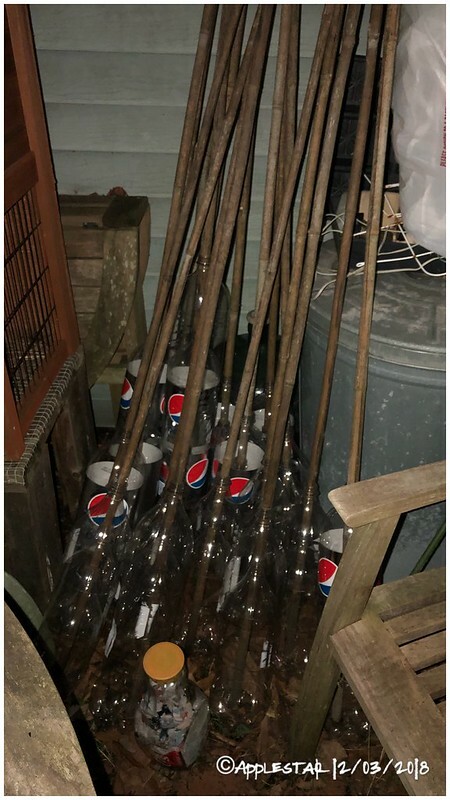 But I had to get all those bottles out of the house, so for now, they will just sit out here like this with the old bamboo poles keeping them in place.... I had another change in mind about how to secure the bottles and what to use for the base/knee wall, so I have to review my ideas yet again. — but if anyone else has been building these, I’d love to hear about yours — I need all the ideas and tips I can get. Typically they cover the bottle-panel walls with something for solid wall— anything from greenhouse film to bubble wrap. If you covered both outside and inside, I think you would get a pretty significant “inflated” double layer effect. Straight-sided bottles like Pepsi are better for tighter fit. I have a lot of Coca Cola bottles that waste about 1/3 of the bottle if I want straight sides, but the narrowed silhouette would be useful where you need the gap/ventilation. One of the alternate ideas I just came across is to use similar idea to make water heating panels — tightly fitted black painted PVC pipes and black painted panel inserts in the bottles. This might be a good North-wall alternative. I’m also trying to wrap my mind around possibly integrating rainwater collection and pumped/circulating water... I really have to rein in my overactive imagination and just do a simple trial build this time around. Those bottles are worth 5 cents for recycling, so most of mine get recycled. I do use a few bottles for emergency water during storm alerts and a few for making fruit fly traps. I have seen people build bottle walls but with concrete and beer bottles. I have seen bottle towers for planters. This is a link to an instructable bottle greenhouse. It needs about 1500 bottles plus the material to build the frame. Wow 5 c? We don’t get anything — no general deposit system except for glass-bottle organic milk at a specific store and I thing there’s a Mexican restaurant that sells fruity soda with deposit on the bottle when you buy take-out.... that I know of. That’s a nice comprehensive instruction link to I think one of the original concept design for the plastic bottle green house. - I don’t like too many meticulous cutting and hole making. - definitely incorporate simple air bubble airlift (air pump water lift) to automate irrigation. There is actually a bottle tax on beverage bottles. It was initially on only single serve bottles and cans, but it was expanded to larger size bottles like 2 liter soda bottles. It is actually 6 cents per container of which 5 cents are redeemable. It can add up if you buy a case of soda or water. It was originally passed to curtail all the bottles that were being left on roadsides and beaches. A lot of people especially the elderly and homeless collect bottles for extra money. They even have bottle thieves who will steal recyclables from people's yards and people dig through trash cans looking for the bottles, however, they are just as likely to scatter the trash all over the ground. There are fewer bottles lying around though. The latest thing now is that the legislature wants to ban styrofoam. Styrofoam containers and plastic straws are the latest things to be phased out. Most of the laws have to do with what ends up as flotsam in the ocean. They wash up on remote beaches where the tides carry them and marine life get trapped in the plastic rings around the drinks and the trash even ends up in the larger species stomachs. Some of the recyclable containers are making their way onto the market and some places has replaced plastic straws with paper ones. Next, wel will have to ban products made from trees. You know when I was a kid, there weren't always take out containers. I remember taking a pot to the restaurant and they would fill it with saimin broth and noodles would be in a paper bag. There are a few old places that still will do that if you bring the pot. It’s great to hear that there are places where more thought and action are taking place to improve recycling efforts and eliminate environmental trash. I’ve seen the glass bottle project ideas (probably only feasible in no-freeze areas) as well as filled plastic bottle projects. If I could think of a way to adapt the glass bottle or jar idea without fear of breakage, I might explore some designs on a small-scale — like accent or window. I’m actually considering the non-recyclable trash-packed plastic bottle-brick concept for water resistant buried foundation or possibly even floor... but I haven’t made up my mind yet. For the time-being, I have started packing a bottle with the labels and rings from these bottles. I would never use bubble wrap as insulating material myself — for one thing, I don’t know how UV resistant those are and plastic that starts to fall apart from sun exposure are a nightmare. I hope they -somebody- had thought of that especially upper grade school projects. Besides.... didn’t everybody see the recent Dr. Who episode? My kids’ declared, they will never pop bubble wrap again! I don't understand this thread? I have cut the bottom off of 2 liter bottles & milk jugs then use the top as a green house over tomato plants in April. Bottle protects the plants from frost at night and is a green house by day. FAQs | PETRA: Information on the Use, Benefits & Safety of PET Plastic. I built this green house.